Eversholt Cricket Club hosted the world-famous Lashings World XI for the sixth time back in August. The match helped to raise precious funds for our Club and a generous donation of £1,500 was made to Cricket East’s Bedfordshire Disability Programme. 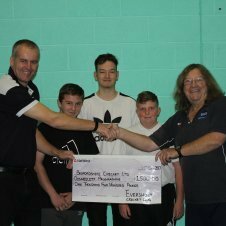 Pictured: Eversholt’s Chairman Dave Garratt (left) presenting the cheque to Disability Development Officer (Bedfordshire & Huntingdonshire) Dave Lawson (right), joined by children from Grange Academy, Kempston.